Enterprises purchased was for about 387,000 cubic metres annually in the Kispiox Timber Supply Area. They face some challenges with the licence in that road maintenance work and bridge decking in some areas have been neglected for 10 to 15 years. The timing now looks brilliant. 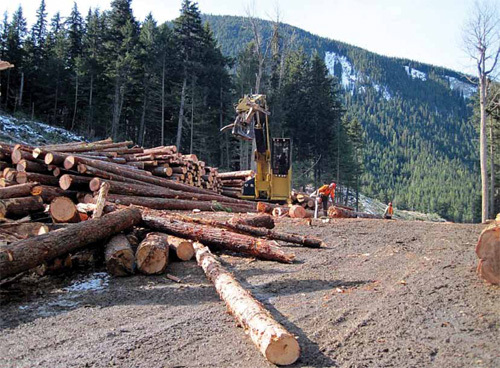 The forest industry throughout British Columbia is in gradual recovery and re-definition mode. There was nothing wrong, either, back when the Gitxsan Hereditary Chiefs decided in 2007 to buy a delinquent forest licence in northwest British Columbia. The problem was the thunderbolt of circumstances that crashed the forest industry and economy between the two events. When the chiefs decided to buy the old Skeena Cellulose Inc licence, there was a lot of promise in the regional forest industry, says Cameron Stevens, general manager for Gitxsan Forest Enterprises Inc. based in the town of Hazelton. A new owner had purchased the Prince Rupert pulp mill and pledged to upgrade it, providing a ready market for the pulp log component of the regional wood basket. But a re-invigorated pulp mill never materialized, for a variety of reasons, and the potential there was never fulfilled. “The chiefs also wanted more direct involvement with the planning and forest management on Gitxsan lands, they wanted more employment opportunities for the Gitxsan people and they wanted to generate wealth within the native community,” summarizes Stevens. These remain guiding principles for the Gitxsan. The forest licence the hereditary chiefs purchased was for about 387,000 cubic metres annually in the Kispiox Timber Supply Area (TSA). Most of the operating area lies north of the unincorporated community of Hazelton. Road maintenance work and bridge decking in some areas of the Kispiox TSA have been neglected for 10 to 15 years and it’s a mountainous, high precipitation region.”We do that work when we’re going to operate in that particular area, that’s the only way it can work,” says Stevens. Consequently, they’ve been starting up their operations closest to the highways, he explains. Hemlock and balsam are dominant in Gitxsan Forest’s part of the TSA with a good 50 per cent of the timber being pulp log quality, continues Stevens.”Pulp prices are pretty good right now and that opens up a few more opportunities,” he points out. 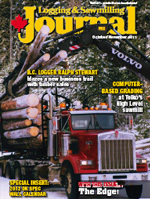 “Gitxsan Forest uses well-established log brokers like All West and Trans Pacific to move its logs out of ports like Kitimat.” Many of them are destined for pulp mills in B.C.’s Lower Mainland and Vancouver Island. During the 2010-11 winter season, the company had two principal logging contractors at work in the TSA. It plans to double that. Apart from the general improvement in the forest economy, the nearby Kitwanga Lumber Mill is back in production and needs a consistent supply of logs to process. Chinese buyers are part of the reason for the Kitwanga start-up. Gitxsan Forest has a proposal before the Canada Action Plan to train its younger workers to operate log harvesting equipment and drive logging trucks. When and if that comes through, it will greatly improve prospects for the chronically under-employed people in the Hazelton region and broaden the pool of forest worker expertise beyond a few with silviculture experience. Wood-based bioenergy industries have a promising role in developing the northwest’s total forest resource. It’s part of the imminent future development of the Kitwanga Lumber Mill, for example, in the form of a wood pellet manufacturing plant. Certainly, there’s no shortage of potential raw material in the regions’ forests to support bioenergy investments. “Our biomass does have a higher moisture content than the dry pine in the mountain pine beetle infestation belt,” notes Stevens. The region also has its share of political issues. Independent studies across many years have made recommendations to improve the forest economy in B.C.’s northwest region. They have concluded the region is distinct and the issues within it need to be addressed as such. However, the status quo remains. For example, the province of B.C. continues to apply interior lumber pricing rules in the region. But it’s clearly not an interior B.C. forest. Just one illustration: the lodgepole pine component in Gitxsan Forest’s operating areas in the Kispiox is approximately four per cent.